In an August press release, the Bureau of Labor Statistics said that Kansas City was the second-worst metro in the country in terms of employment change. Between August 2010 and August 2011, the region lost more than 11,000 jobs. Only Atlanta had a worse year-over-year performance. This had us scratching our heads because it is unusual for Kansas City to be at the extreme end of most economic issues. Generally we tend towards the median. Fasten your seatbelts. After posting that loss of 11,000 jobs in August, the September data shows a robust rebound — jobs in the region are up nearly 3,000 over September 2010. Now, an employment increase of 3,000 jobs is nothing to write home about. In fact, it is a very bad annual figure — but at least it is on the positive side of the ledger. The negative August numbers got a lot of press. September’s good news needs some coverage, too. 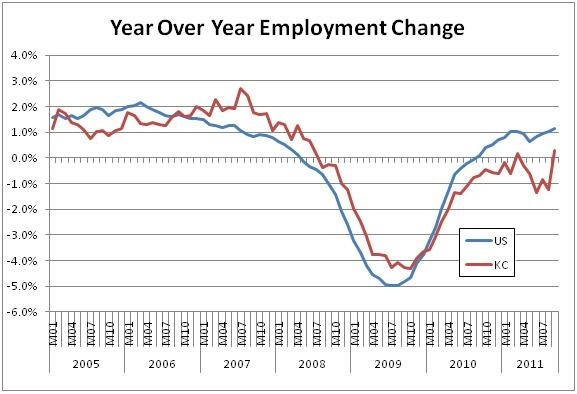 The chart below shows that while U.S. employment (as measured by a year-over-year percent change) turned upwards in late 2009, and stayed positive through the middle of 2010, Kansas City’s has zigged and zagged. We’ve struggled to show consistent year-over- year growth since before the recession. Our September spike is evident on the extreme right side of the chart. We will see in coming months if this spike is an anomaly or whether we can put the neck braces away and begin to enjoy the smoother ride of a long-term employment expansion.